Bulk California Natural Seedless raisin shipments to domestic and international markets increased by 8% in January though shipments are still down 47K packed tons or 33% from August 1st to January 31st. While the distance from last year remains wide, the gap is closing -- albeit slowly. Momentum is in the right direction and the quality of raisins from California is excellent this year for bulk Natural Thompson Seedless raisins, Flame raisins, Golden Seedless, and other California raisin types. There is attractive current pricing for Flame raisins and Natural Thompson Select (NTS) raisins while due to shortages, prices for Zante Currants are quite high. The South African raisin crop in 2019 is expected to be normal though will likely not exceed 65K tons due to lower yields for Sultana raisins. Last week the intake from the fields jumped up. It has been dry for the past 14 days with some rain prior to that. First shipments of South African raisins will begin in mid-March. The processing capabilities of South African raisins processors have steadily improved, helping to open new export markets for bulk South African raisins. We supply South African Thompson and Sultana raisins as well as South African Golden raisins and welcome your inquiries. The Chilean raisin crop in 2019 is also expected to be normal with favorable growing conditions. There is some talk of slower-than-usual table grape business in Chile so there may be relatively more grapes destined to become raisins and shipped abroad compared to last year. The full crop size and quality remains to be seen but all signs so far appear positive for Chile’s raisin harvest. We supply all major bulk California raisins including dried-on-the-vine (DOV) and tray-dried Natural Thompson Seedless Selects, Selma Petes, Flames, Goldens, and other varieties in Jumbo, Select, and Midget sizes and welcome your inquiries. We also supply Selma Pete DOV Double-Run Supreme raisins to Japan and elsewhere which are processed twice to achieve exceptionally low stem and capstem counts. We offer multiple packaging options including custom boxes with client branding, supplier branded boxes, and blank unbranded boxes. We also supply South African and Chilean raisins and welcome your inquiries for new crop. 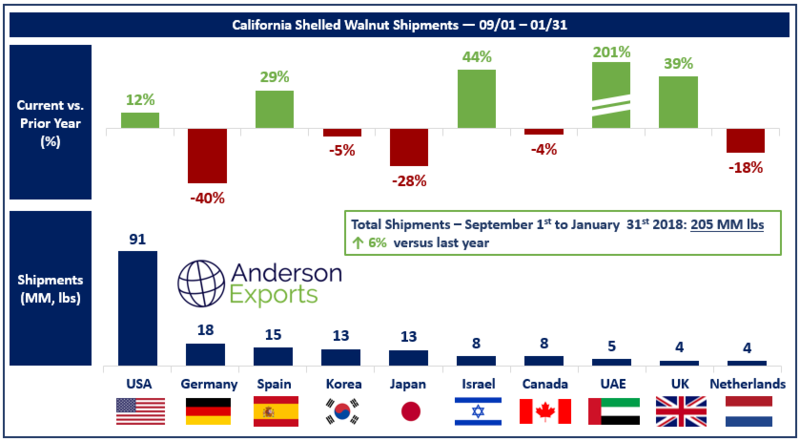 California shelled walnut shipments were strong in January, up 20% compared to last year. From September 1st to January 31st, shipments of shelled California walnuts totaled 205 million pounds, up 3% or 6 MM lbs compared to the prior year. The domestic demand for California shelled walnuts clearly continues to be strong with shipments up 12% or 9.8MM lbs for a total of 91MM lbs from September 1st to January 31st. On the export side, shipments to many of the top markets have varied widely this year. Shipments to the top foreign market for California shelled walnuts, Germany, are down a staggering 40% or 12.1MM lbs. Over the same period, Germany is also down significantly (2MM lbs / 21%) on California in-shell walnut shipments. Other top markets down in shelled shipments included Korea (0.8MM lbs / 5%), Japan (4.9MM lbs / 28%), Canada (0.3MM lbs / 4%), and the Netherlands (0.9MM / 18%). The U.A.E. 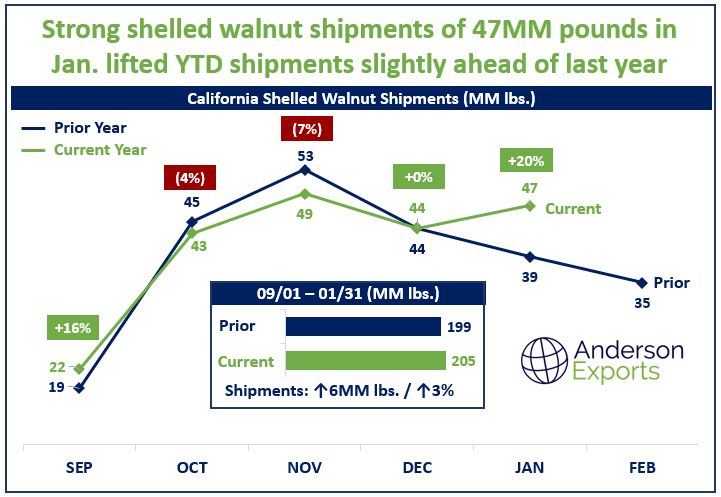 is stand-out market for growth in shelled walnut shipments from California this year, up 201% or 3.5 MM lbs. For in-shell California walnut shipments, the U.A.E. was also a top market for growth this year, importing 20MM lbs or 92% more than the prior year period. Other markets growing in tonnage include Spain (3.2MM lbs / 29%), Israel (2.3MM lbs / 44%), and the UK (1.2 MM lbs / 39%). Shortages of Chandler continue and offers are few and far in between. Buyers who covered forward needs early of California LHP are pleased as prices have increased considerably and availability has tightened as well. Due to rain in California, some in-shell processing has been delayed since walnuts cannot be processed outdoors during periods of precipitation. Overall, the market for shelled California walnuts remains firm. Chile’s walnut crop is expected to be high quality and larger yet again due to increased planted acreage of Chandler and other walnut varieties. Early indications of pricing are becoming more refined after many price discussions occurred at Gulfood in Dubai. Bulk Chilean walnuts will be available shortly and we welcome your inquiries for Chilean in-shell and shelled products. We work with California’s top walnut packers to supply our customers with Jumbo and Jumbo / Large (J/L) in-shell Chandler, Howard, Hartley, Vina, Tulare, Serr and other varieties. We also provide bleached in-shell walnuts in addition to California shelled product including Chandler and non-Chandler Light Halves & Pieces (LHP) 20%, 40%, 80% and higher based on customer requirements. We also supply Combo Halves and Pieces (CHP). California’s Sierra Nevada mountains are currently receiving historic snowfalls with February 2019 setting records for the snowiest recorded February ever with Mammoth Mountain in Northern California reporting 186 inches (473 cm) of snowfall just in the month of February. The images above are taken from NASA, showing the same region on Feb. 15, 2018 (left image) and on Feb. 11 2019 (right image). You can even see in the right image a much more visibly green Central Valley of California. Over the last decade, California’s water situation has been defined by drought. One of the worst years in recent memory was 2015. This exceptionally dry season was preceded by years of a progressively smaller snowpack in the high Sierra, as seen in the images below (2012 - 2015). As can be seen in these images, 2015 was perhaps one of the worst years on record for California’s snowpack. Now, look at the images below, taken in February and March of 2019. You can clearly see the difference between 2015 and today. 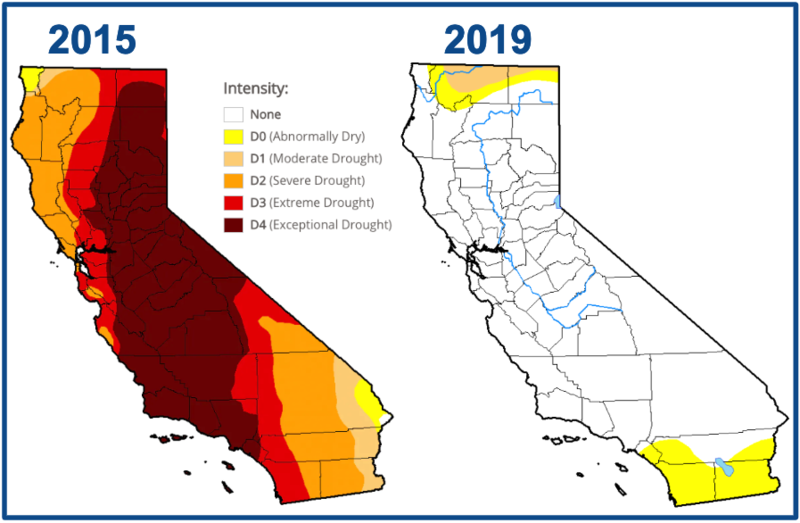 This very likely means drought will not be an issue for California’s 2019 crop. Snowpack is one of the most important sources of water for irrigation in California. Not only does snowpack recharge California’s surface water (rivers, lakes, reservoirs, etc. ), it also feeds California’s vast stores of groundwater. Both surface water and groundwater supply California’s immense agricultural industry in different, but important ways. When understanding the resource of water, it is important to make a distinction between surface water and groundwater. Surface Water is all the water contained in earth’s surface features, both natural (lakes, rivers, deltas, etc.) and man-made (reservoirs, aqueducts, locks, etc.). You can think of surface water as a paycheck that comes in every month. If you use all the money before the end of the month, you may have a few lean days, but you will likely make it to the next month’s check, i.e. each year the winter snowpack is this paycheck for California’s surface water accounts. If all the surface water is used up from lakes, rivers, reservoirs and aqueducts during a given year, it is usually replaced in the form of snowpack each winter. By comparison, groundwater is much more like a 401k, or a savings account. It takes much longer for water to percolate from the surface to deep inside the earth where this water collects in the aquifers which underlie California’s Central Valley. And, just like a retirement or savings account, it is dangerous for your future to pull too much at once. Too many drought years with low snowpack in a row can cause farmers with low to no surface water access to draw groundwater instead. Since this resource is not replenished easily, drawing too much groundwater can have dire consequences, as the Central Valley knows only too well. In 2015 water had to be trucked into many parts of the state as public water resources either ran dry or became too toxic to drink (there are natural salts in the ground and in groundwater, if you pull too much groundwater, the remaining salt concentrates in the remaining water making it increasingly toxic to both humans and orchards). In years of excess snowpack, not only is there ample surface water, but this extra volume of fresh water also makes possible this extremely important recharging of groundwater aquifers. This year’s snowpack is a very good indication that there will be an abundance of water for California agriculture. Finally, compare the following United States Drought Monitor maps for February, 2015 vs. February, 2019. In addition to the plentiful snowpack in California’s High Sierras, the current drought monitoring data also shows favorable conditions for California agriculture. We work with a number of other products so please reach out if you have an inquiry for something you do not see here. We are experts in sourcing bulk food ingredients and welcome the opportunity to work with you on your inquiries. Some of our other product offerings include sunflower seeds, lentils, green peas, freeze dried fruits, popcorn, dried cherries, dried apples, dried blueberries, cherry concentrate, quinoa, dried honey dates, dried cherry tomatoes, dried gojis, dried kiwis, dried strawberries, chickpeas, chia seeds, dried mulberries, almonds, macadamias, pistachios, walnuts, cashews, pine nuts, pecans, brazil nuts, pumpkin seed kernels, melon kernels, hazelnuts, dried prunes, golden raisins, sultanas, dried apricots, sweet apricot kernels, dried black currants, dried figs, dried dates, popcorns, maraschino cherries, dried tomatoes, strawberry pie filling, blueberry pie filling, cherry pie filling, dried mangoes, dried gingers, dried pineapple, and desiccated coconut. We are always looking to grow our supplier base with companies capable of delivering high quality food ingredients at large volumes. If you are interested, please reach out and introduce yourself.